The welcome region on the formerly-recently-relaunched AviWorlds grid. This time, AviWorlds shut down not with a loud scandal, but without even a whisper. Over the past few days, grid owner Alexsandro Pomposelli has opted not to renew his grid servers, let his domain name expire, and shut down his media accounts and stopped responding to emails, Skype messages, and phone calls. While most of this could be due to, say, the owner being held hostage by a crazy clown in the woods somewhere — hey, stranger things have happened with this grid — shutting down the social media pages takes deliberate effort. So I’m officially calling it a grid closing as opposed to an outage, making it the tenth time the grid has shut down. Many grids have downtime. There’s a problem with a server, or some maintenance needs to be done, or someone tripped over a power cord. It happens. Usually, the grid communicates with its residents through social media or email, and responds to media request for comment — that’s me, pretty much — and makes promises about getting up and running that it may or many not keep. What’s also worrying is that the grid’s most recent domain name, aviworlds.us, seems to be up for sale for $12. GoDaddy, where the domain is registered, has a 42-day grace period on expired domain names, so Pomposelli still has time to get it back. He also owns the aviworlds.com domain, which is registered through August. 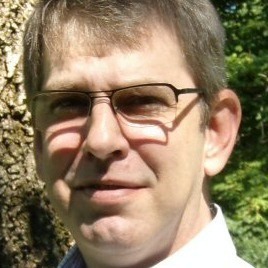 However, last week, Pomposelli seems to have decided not to renew his grid servers, and the grid went down on Friday. DigiWorldz owner Terry Ford said that he has some backups. That means that users will, once again, depend on Pomposelli for their region backups, unless they were prescient enough to make sure they have their own backups. As I recommended numerous times. “It will be up to them to contact him for a copy of the OAR file if he allows them to have it,” said Ford. DigiWorldz does not have a full database backup of the grid, however. Region backups, or OAR files, allow a grid to be rebuilt, region by region. They do not include user inventories or asset databases or profiles or messages or any of the other things that a grid keeps track of. A full database backup allows the grid to be restarted with everything in place — inventories, assets, and so on. Pomposelli chose not to do this. Instead, the backups for the grid servers were on the grid servers — the same servers he did not renew. The aviworlds.us domain name was used for the grid’s loginURI and hypergrid address. That domain is no longer active, and the stats report page is down as well. There was no website at that URL. Pomposelli said he was working on getting a site back up, but meanwhile, he had been using a Facebook page as the grid’s official website. 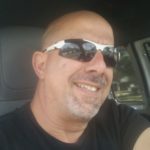 That page, facebook.com/aviwordsgrid, is now also down, as is the Twitter account @AviWorlds and his Google Plus page. The domain name, the grid servers, the not responding to messages — that can all be due to some accident. But taking down the Facebook page is intentional. It doesn’t just happen by itself — someone has to go in and delete it. With the most recent launch, Pomposelli did not even pretend to have a business model. His plan was to give away plots and regions for free. “The free regions are 15,000 prims each, with one region per user,” he told Hypergrid Business last month. The AV$ currency will be available in-world, but it will be a completely fictional currency. So how will the grid stay in business? For example, he was considering a freemium model. “If they want more than one region then they have to pay,” he said. 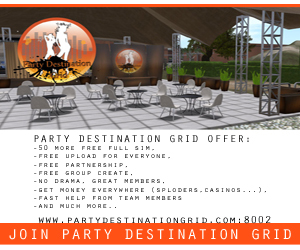 There might also be an option for people to donate money to the grid, and he pointed to OSgrid as an example. 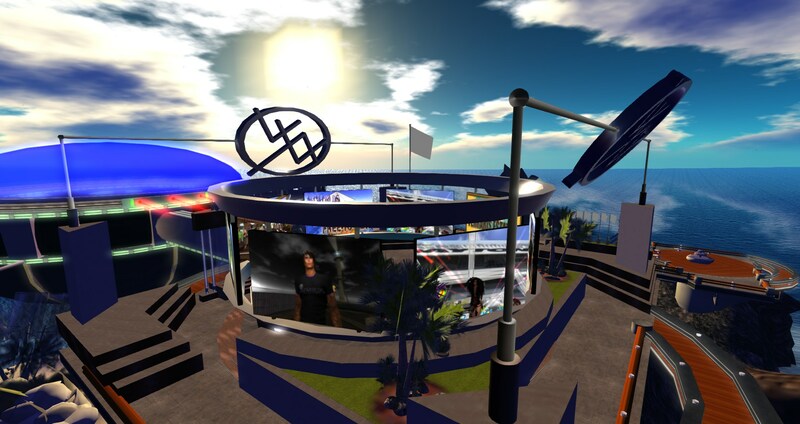 However, OSgrid is a registered non-profit, and donations are tax-deductible. This is not a simple process, and Pomposelli didn’t have a real plan for that, either. As of the last stats report, AviWorlds had the equivalent of 245 standard regions, making it the 26th largest OpenSim grid by land area. At that time, it had 80 active users, which was up to 131 as of last Friday. That would have made it the 43rd most popular grid by traffic numbers. So, despite a long history of severe problems, people still keep coming back. If the grid bounces back — for the eleventh time — and you are interested in participating, remember to use a foreign avatar for all your in-world activity. One from OSgrid, Kitely, or one of the hundreds of other grids out there which are infinitely more reliable. That way, when AviWorlds goes down again, you won’t lose your inventory. In addition, if you do get land, remember to get plenty of backups. Lots and lots and lots of backups. Or just pick a better grid to build on right from the start. 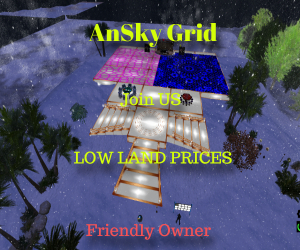 OpenSim land prices are extremely reasonable and several other grids also offer free land.